That’s what we are most of the time. Dusty. Sweaty. Dirty. It’s like a backpacker rite of passage, but really, it just feels gross. Our days are filled with activity of one sort or another – biking, hiking, swimming, even just wandering around town for hours. While an endless summer of travel certainly has its advantages, it does make for a ripe experience clothing-wise. With only a few changes of gear each it seems like we are constantly sifting our clothes into piles of ‘dirty’ or ‘less dirty’. When we chose items to take on this journey, we very specifically packed things that could be washed easily by hand. The thing is, you can only get clothes to a certain degree of clean in a sink, especially after 6 hours of hiking on dusty trails in 90 degree heat. I’ve taken to wearing my clothes into the shower sometimes and beginning to wash them right on my body. In El Bolson, Argentina, we went on a hike that covered us in so much dust that I thought my blue socks would never recover. It took 30 minutes of scrubbing before they came even close to resembling their former selves. 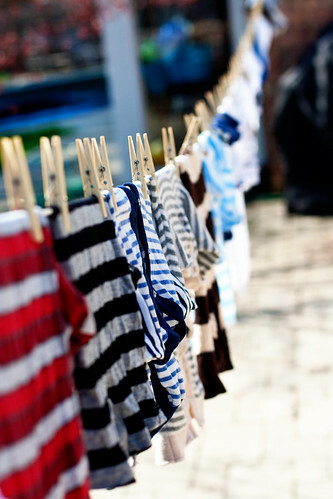 Last week we finally gave in and paid an exorbitant amount of money in Valdivia, Chile for our clothes to be laundered. It wasn’t until we were back at the hostel unpacking our clothes from the laundromat’s bag that we realized our clothes still weren’t clean. We smelled them. They clearly had been washed because they definitely smelled better, but they were still dirty. The ends of my pants legs still emitted dust if I plucked at them. The pits of our shirts still felt…off… It was too late to go back and complain, so we chalked it up to crappy washing machines and vowed to open and check our clothes at the laundromat from here on out. We chose the ‘least dirty’ clothes once again, and headed out to Pucon. We’ve spent the last few days at the home of a woman in Puerto Varas. She has a washing machine. For a reasonable fee she told us she would wash our clothes for us. We kept our expectations low and set out for the day in the only items we hadn’t put aside for laundering. This means I wore pajama pants to lunch. We returned at the end of the day to find our clothes folded and neatly stacked outside our bedroom door. It was with much trepidation that we carefully unfolded and inspected each item. They smelled good. They felt good. Vigorous shaking produced no dust! We finally, finally, finally, have actual clean clothes! Today we leave for Puerto Natales to embark on a series of camping/backpacking trips in some of Chile and Argentina’s finest national parks. We should be filthy as ever in no time. I posted this to reddit – thought they may have some pointers for your adventures. Nice, thanks! We miss you too!! !